The book is filled with high quality images of Van Gogh’s paintings and is more the size of a coffee table book. 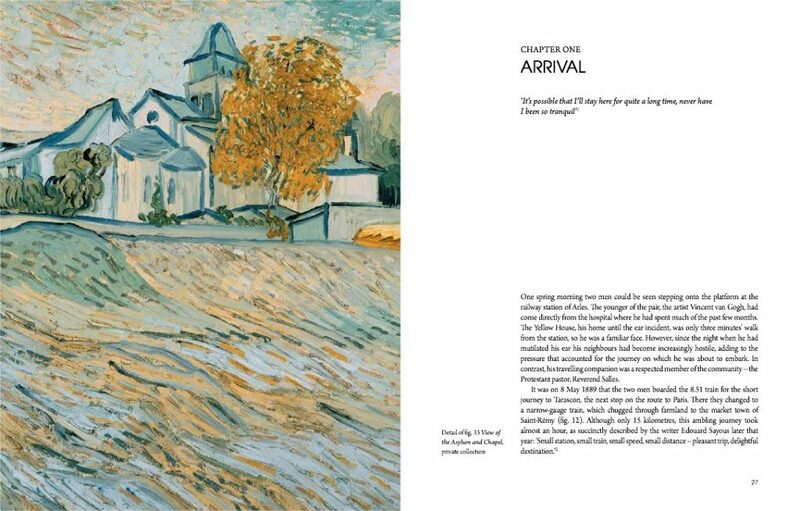 This book is an account of Van Gogh’s final year, which he spent here in Saint Remy de Provence. His brother, Theo, decided that Van Gogh was unfit to live alone after he had mutilated himself by cutting off his ear after an argument with Paul Gaugin. Wrapping his ear in paper and then presenting it to a young woman in a local brothel didn’t help his cause either. Theo, an art dealer, supported his brother and sent him paints from Paris in exchange for paintings. Bailey points out in the book that there is a correlation between Van Gogh’s episodes of manic depression and receiving news from his brother of marrying his wife subsequently having a baby. Van Gogh’s fear of abandonment may have been the cause of his self mutilation, made even more tragic by Theo’s failure to visit his brother in the South of France when he was only in Paris himself. 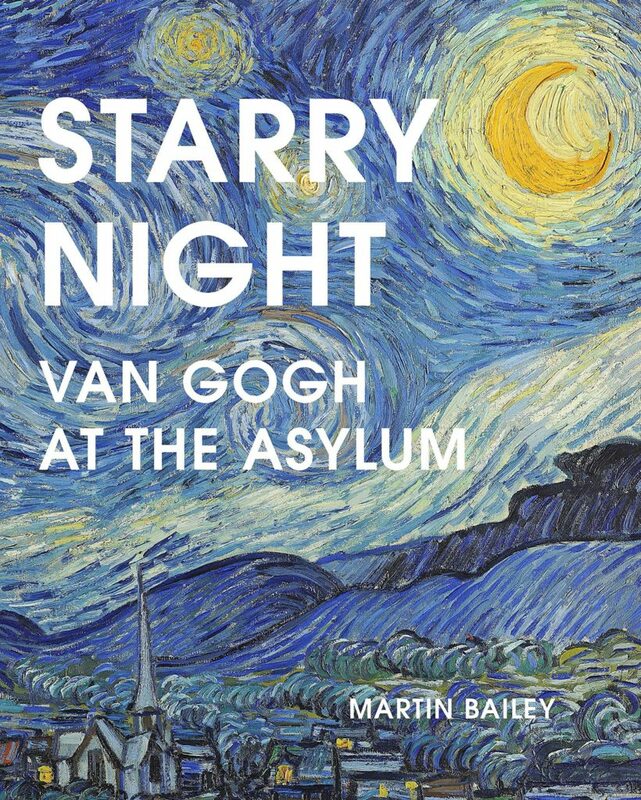 Bailey is a leading specialist on Van Gogh and details Van Gogh’s illness during his time at the asylum, where he painted over 150 paintings. During this time, he had several episodes of attempting to poison himself, often with his own paints. During these acute attacks of mania accompanied by visual and auditory hallucinations Van Gogh believed that someone else was poisoning him. Bailey points out that today, in addition to creeping epilepsy, Van Gogh would be diagnosed with bipolar disorder. It was at Saint Paul de Mausole where Van Gogh painted Starry Night, the celestial view of Saint Remy de Provence. Van Gogh also painted the extensive gardens of sunflowers, iris, and wheat. 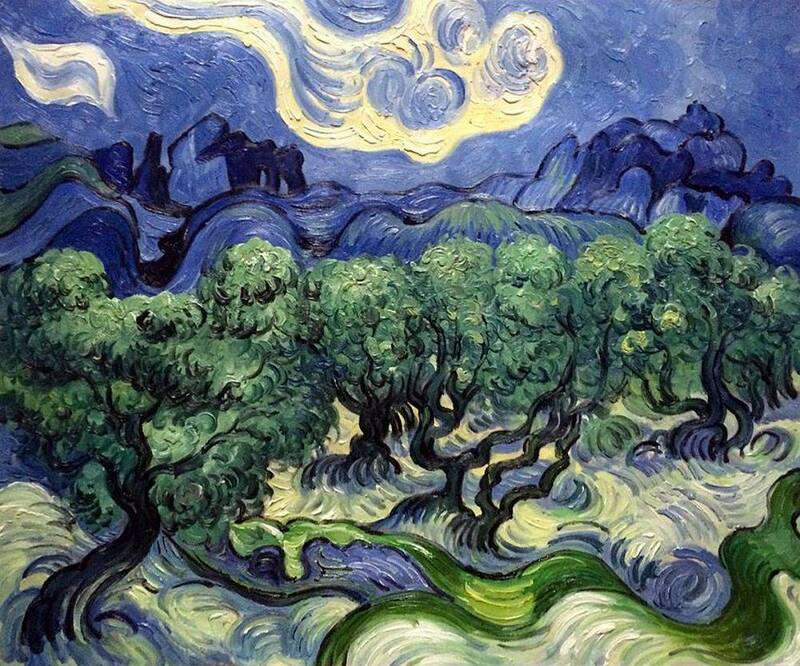 Some of my favourite paintings are Van Gogh’s olive groves, with the Alpilles mountains in the background. One of my favourites. Although Van Gogh would not have known it, this grove lay above the buried ruins of Glanum, which was hidden until excavations in the 1920s. In his time, many of these trees were centuries old. Amazing! 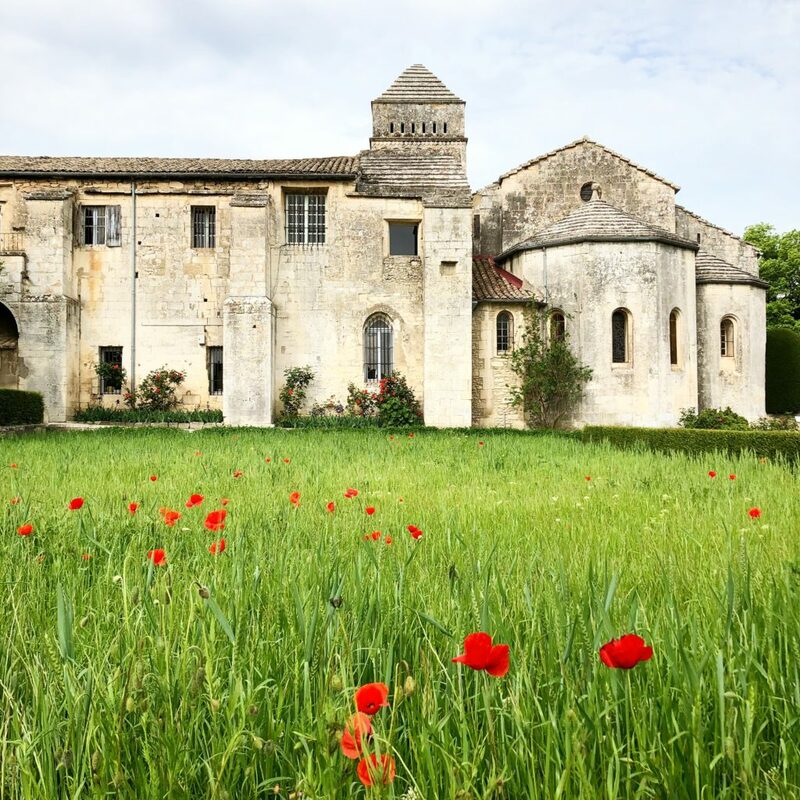 At the monastery you can visit the 12th century cloister, the room where Van Gogh painted, and the gardens which are lovely throughout the year; especially in the spring, where you’ll find draping wisteria and poppies in the fields. There are still some patients living here that are involved with an art therapy program. Their artwork, often Van Gogh inspired, is for sale in the boutique. 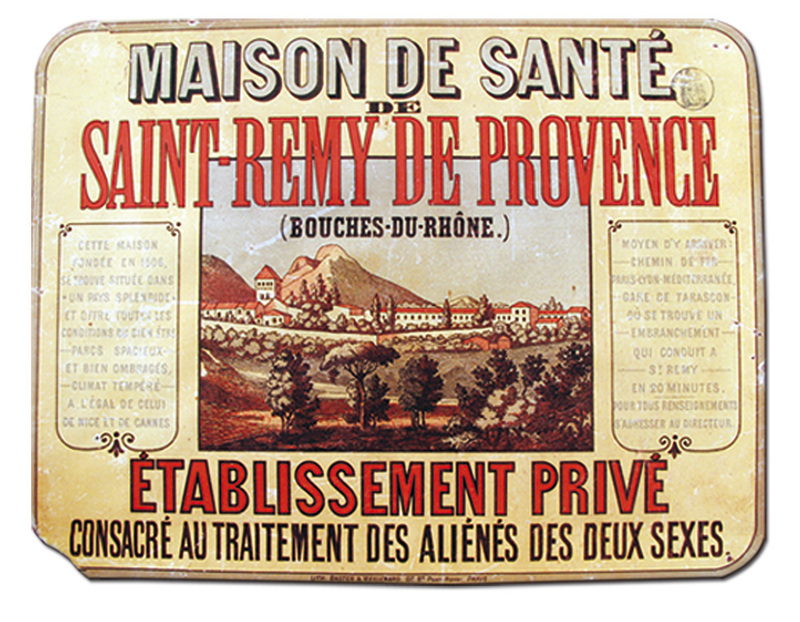 From the tourism office of Saint Remy, walk the 1 km south along a straight road that leads to the asylum. Every 20 paces or so there’s a panel with an example of one of Van Gogh’s many paintings of the region and an excerpt from his letters to his brother Theo. Across from the asylum, you can visit Les Antiques as well as Glanum, where you’ll find Celtic and Roman ruins of a town that was once very important on the Roman trade route. The light show set to music in an old quarry in Les Baux is showcasing Van Gogh paintings starting in 2019. I honestly can’t wait!! If you’d like to go with me, book a Curiousprovence private tour during your stay and we’ll have a fun day out filled with culture, food, and stunning scenery. This exhibition is always difficult to explain. It’s immersive art, in an old quarry with moving images and music. Thank you for this! We ‘did’ the Van Gogh walk in St Remy last week, ending at St Paul de Mausole. Similarly, I knew little about Van Gogh’s history or paintings nor about his French connection. Now I am enthralled so will definitely seek out the book you’ve mentioned. One correction though – I understood from the visit to St Paul de Mausole that Van Gogh’s bedroom there is recreated from his descriptions in his letters to Theo (down to the green walls and the green curtains with the pink roses on them). It is not the bedroom in the famous picture he painted. This was his bedroom in the ‘yellow house’ in Arles. Thank you for that Jane. The book I believe talks about that painting as being his bedroom in St Paul and describes in detail what paintings he had on the wall there. After visiting many times I have to say it does look very similar! 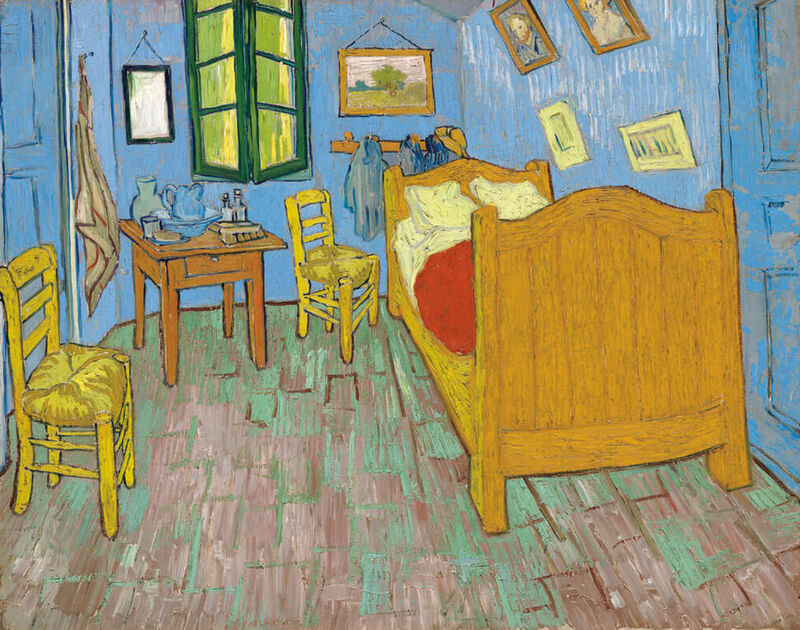 Though, the real bedroom of Van Gogh at St Paul is actually a floor above the one open for visitors. Don’t know about the one in Arles but who knows! It is always striking to see one of Van Gogh’s paintings and then see the actual landscape he painted, like the one you show of the olive groves. They are the same and yet different. 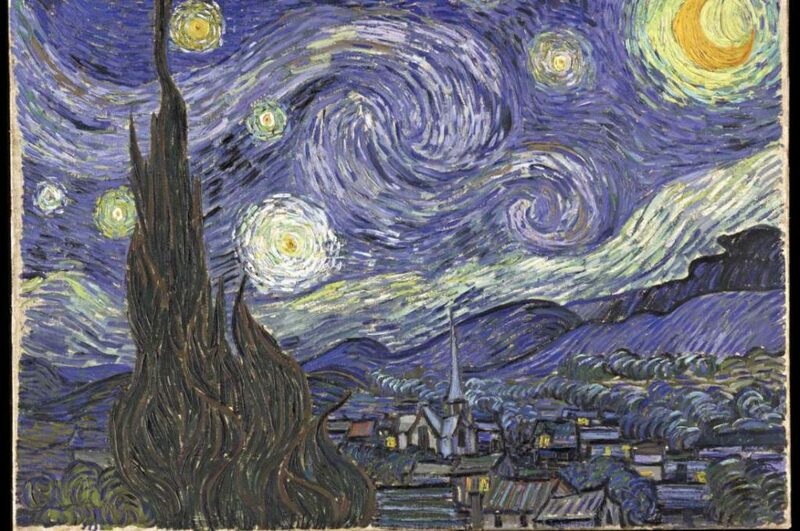 I had the good fortune of seeing Starry Night at the NY Museum of Modern Art this weekend–wow! It’s kind of a dreamscape: are those the Alpilles? Where does that spire come from? I just love Van Gogh’s paintings. The Spire is the actual church in St Remy and yes- those are the Alpilles. So proud. I’d love to go to the museum dedicated to his works in the Netherlands. One day… Great that you saw Starry Night! My wife and I visited Glanum and Saint Paul de Mausole a couple weeks ago during our stay in Saint Remy. One of the things that thrilled us was seeing “in real life” the strange holes depicted in Montagne des Deux Trous. We’d assumed that had just been Van Gogh taking artistic license. >>From the tourism office of Saint Remy, walk the 1 km north along a straight road that leads to the asylum. I think that you mean to send readers south, not north, from the tourism office, right? Thank you for your posts. They were quite helpful in making plans for our stay in Provence. Hello! yes, you’re right, I did mean South. Les Deux Trous, or the 2 holes, is a popular walk with locals where you can walk up to see them. The walk starts from behind Saint Paul de Mausole and the view from up there is amazing! Thanks for reading.